If you're interested in fluid mechanics, you will definitely find this Bernoulli equation calculator to be extremely helpful. It is a tool that allows you to compare two points along a streamline and determine the elevation, flow speed and pressure at each of them. Additionally, you can use the Bernoulli calculator to find out what is the flow rate of the analyzed fluid. This way, you can choose proper pipe diameters to ensure that the flow is steady. Keep reading to learn more about the Bernoulli equation, or take a look at our buoyancy calculator! The Bernoulli equation describes a steady flow of an incompressible fluid. It means that the fluid doesn't change its properties (for example density) over time. According to the Bernoulli principle, the total pressure of such fluid (both static and dynamic) remains constant along the streamline, regardless of the changes in the environment. g is the acceleration due to gravity (on Earth typically taken as 9.80665 m/s²). The term 0.5ρv² corresponds to kinetic energy per unit volume and ρhg is the hydrostatic pressure. It means that once you know five of the following values: p₁, v₁, h₁, p₂, v₂, and h₂, you can easily calculate the sixth with the help of our calculator. Choose the density of the fluid. We can assume ρ = 1000 kg/m³. Determine the properties of the fluid at the initial point. Let's assume that the fluid is under the pressure of 1000 Pa, at the height of 3 meters, and flows with the speed of 2 meters per second. Choose two out of three properties of the fluid in the second point. We can say that the pressure increased to 1200 Pa without a change in elevation. You have found the new flow speed of the fluid. It is equal to 1.897 m/s. 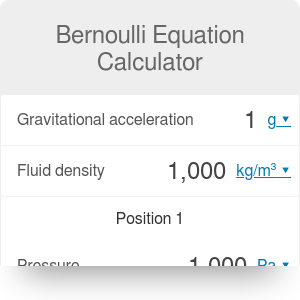 You can also use the Bernoulli equation calculator to determine the volumetric and mass flow rate of your fluid. A flow rate describes how many cubic meters (in the case of volumetric flow rate) or how many kilograms (in the case of mass flow rate) flow through one point on the streamline during one hour. v is the flow speed in m/s. As mentioned before, this Bernoulli equation calculator can only be used to analyze the flow of an incompressible fluid. It means that the fluid has a constant density and cannot be compressed under pressure. Still, it is possible to develop a similar equation for compressible fluids. In such a case, the influence of the change in elevation is omitted. However, the flow is then dependent on an additional value - the specific heat of the fluid. Bernoulli Equation Calculator can be embedded on your website to enrich the content you wrote and make it easier for your visitors to understand your message.